Fastred is a Nord farmer and a resident of Ivarstead. She lives with her parents, Boti and Jofthor, at Fellstar Farm. She harbors dreams of becoming an adventurer, and will pester you for tales of your adventures. However, her dreams seem to be interfering with her work on the farm, as her parents can be overheard chiding her to "pitch in a little more". She is infatuated with Bassianus Axius. Depending on your actions in The Book of Love, Fastred's love life can be considerably altered. After initially approaching her and revealing that you have been sent by Mara, she asks you to confront her parents regarding her wish to be together with Bassianus. 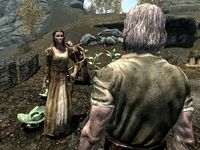 She will elope with him to Riften if you mention to Bassianus that her mother is supportive of the relationship. However, if you decide to encourage an old love, Klimmek, to be more assertive, she will end up with him instead and opt to stay in Ivarstead. She wears a belted tunic and a pair of boots. She is equipped with an iron dagger, and carries a key to the farmhouse, as well as a selection of common loot and gold. 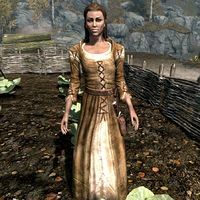 When she is still living in Ivarstead, Fastred will be quick to ask you about your travels: "Oh! You're a traveler! You must have so much to tell about the world outside this boring town!" No matter where she is, Fastred may also greet you with, "Have anything interesting to tell me?" She will also reveal to you how she wishes she could be a traveler and journey across the world: "I can't imagine how exciting it must be like to journey from place to place. You're so lucky!" 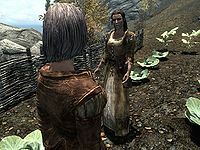 She will close dialogue with, "I wish I could go with you..."
The Book of Love: Help the Temple of Mara spread the cause of love throughout Skyrim. This page was last modified on 14 February 2015, at 09:29.